This has been our second inspection trip to India in 2016. Our India tour programme in 2016 hase been successful, and our March/April trip to South Kerala was wonderful, so in December we went further up the coast into Karnataka and Goa. My colleague, Rob, and I arrived at Bangalore, now called Bengaluru, on 19th December. The first thing I noticed when leaving the plane was the comfortable, cool air. Unlike other parts of South India where the heat hits you like an electric shock, this part of India is most pleasant and mild - sunny, dry and warm, rather like a British 'Indian Summer'. We checked in at The Oberoi. 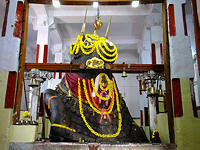 We use other Oberoi Hotels in Shimla and Mumbai for our tours so we know their hotel standard is excellent. Everywhere we turned we would be greeted by staff, often by our names. 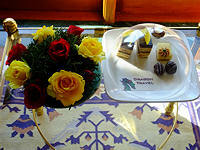 On entering our room there was a tray of beautiful cakes and chocolates with our company logo on the plate waiting for us on the coffee table. Shortly afterwards a butler arrived with a tray of fresh exotic fruit juices to serve to us as a welcoming drink. He can be called upon by ringing a bell for more drinks or even ironing services, all part of the hotels high service standard to guests. It is just so welcoming. 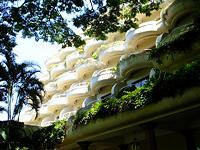 The building of The Oberoi Bangaluru is well known for its balconies. 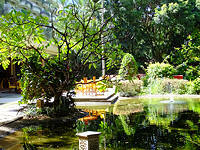 Each room has its own balcony looking out over the large and beautiful tropical gardens and ponds. There is also a lovely swimming pool and terrace for afternoon tea and cocktail drinks. Both the breakfast and evening buffet were excellent, especially as we could also order anything that was not on display for delivery to our table. We ordered tandoori fish and it was freshly cooked and still hot from the tandoor. For breakfast there were about ten different fresh exotic fruit juices to choose from, such as coconut water, pomegranate and other local fruits and spiced drinks. We are using Oberoi in our Special Hotels category. 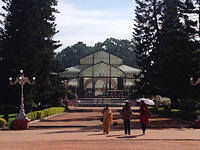 Next morning we started our Bangaluru city tour with a visit to the Botanical gardens. The 240 acres of landscaped terrain includes many plants, trees, rose gardens, lakes and ponds plus the pavilion greenhouse dating back to Victorian times. The morning visit was very pleasant with fewer visitors, except for the monkeys dangling from the trees by the lakeside. Crowds can build up during the day. 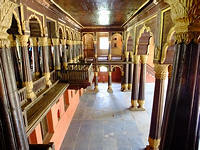 Next we visited the Bull Temple and Dodda Ganesha Temple, followed by Tipu Sultans's Palace, well known for its teak pillars and ornamental frescoes, the Government museum and local market. We also inspected three more hotels. First we visited Clarks Exotica and had an excellent buffet lunch at this hotel. The second was the Goldfinch Retreat, a smaller hotel just outside the city in a quieter rural setting. The third was the Movenpick city hotel. We are using these hotels in both our Deluxe and Superior hotels categories. 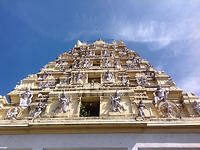 Next morning we left Bangaluru and drove to Mysore.